World leading, large format scanner manufacturer Colortrac approached Soap to refresh their online presence and drive leads from 18 different countries. Colortrac, a Queen’s award-winning company, were seeking a world class agency to develop lead generating websites and marketing campaigns for the various countries they operate in. It needed multilingual, localised websites where leads could be automatically filtered to the most relevant distributor globally. As well as driving a new stream of new leads via SEO and PPC, and improving the conversion process through multivariate testing. Coded in HTML 5, the design is responsive to different screen resolutions across mobile and tablet devices. To improve the conversion rate of PPC traffic, we created a standalone squeeze page to maximise marketing spend. As Colortrac already had decent good rankings, we had to be thorough with the migration and re-optimisation of the pages to first maintain, then improve organic rankings. We created a clean, simple site with subtle designs which ultimately lead the customer towards a call to action or key area of the website. 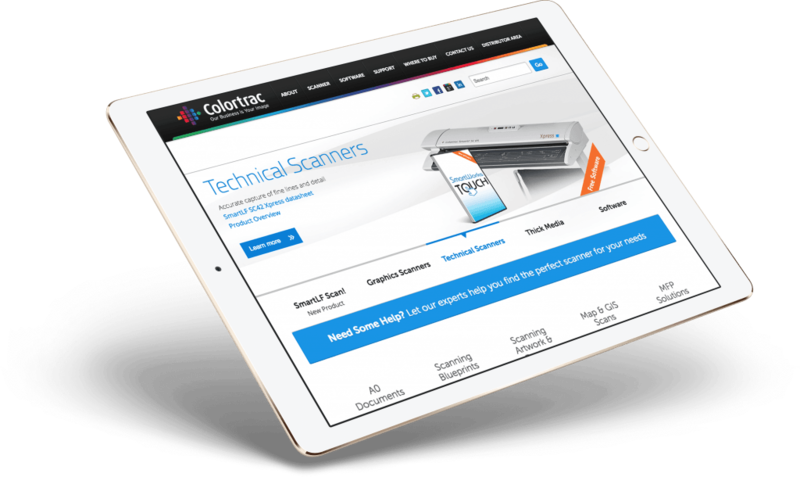 Colortrac’s website is now colourful (aptly! ), lively, and easy to navigate, ensuring customers visit the site and enjoy a state of the art user experience. Take a look at what Peter had to say about us. Since working with Soap our online performance globally has increased significantly. Not only are Soap strategic in their approach, consistent in their performance, but their team are a pleasure to deal with too!